Square Enix is very sorry, but localized Japanese versions of Call of Duty: Black Ops are going to be cut just a little wee bit more than it promised. Square Enix, which is publishing Call of Duty: Black Ops in Japan, announced in September that the game was being "tweaked" in order to satisfy the requirements of the country's game rating authority. As a result, the "brutal or grotesque portrayal" of dismemberment will be either toned down or removed completely from the Japanese editions of the game. Square Enix said at the time that the zombie mode would remain "unaltered," but apparently it spoke a little too soon. Two versions of the game are being released, one dubbed and one in English with Japanese subtitles, and today the publisher revealed that all instances of swastikas in zombie mode will be replaced with the iron cross in the Windows and dubbed console versions of the game. For some reason, however, the subtitled console editions will keep the swastikas. It's a tiny change and one that would probably go unnoticed by most gamers if Square Enix didn't point it out. I'm not really sure why it's bothering, though; censoring the German release is understandable, what with all that unpleasantness back in the 30s and 40s, but is this an issue for Japan as well? Regardless, because it had promised that zombie mode would be "unaltered," the company also issued an official apology for the change. 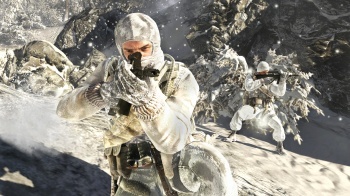 Call of Duty: Black Ops comes out on November 9 for the PC, PlayStation 3, Xbox 360, Nintendo Wii and DS.